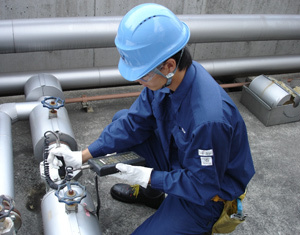 Working with TLV for almost ten years, Singapore Refining Company managed to achieve significant savings through improved steam trap management. Singapore Refining Company (SRC), one of three petroleum refineries in Singapore, was suffering from a large number of trap failures in 2003. A survey conducted by TLV showed that trap failure rate was around 50%. This represented significant annual monetary losses from steam leaks alone. Concerned with this high failure rate, the Energy & Loss Control Team at SRC worked with TLV to devise a plan for the gradual replacement of failed steam traps, including performance monitoring via steam trap inspections. To improve overall trap and plant reliability, part of the plan also involved the replacement of failed steam traps with TLV SS1 and JH5 Free Float® traps. The plan was put into action over the next few years, resulting in tremendous success. The steam trap failure rate had dropped to less than half in 2004 (compared to 2003) and progressively declined to reach an all-time low of less than 5% in 2010. The newly installed TLV traps played an important part in the plan. In low-medium pressure applications, only 1.4% of the new TLV SS1 steam traps failed within 5 years of service. In high pressure applications, only 3.9% of the newly installed TLV JH5 steam traps failed within 4 years of service. The end result was that SRC was not only able to conserve a significant amount of energy and reduce its carbon footprint, but also achieve large savings through better steam trap management.